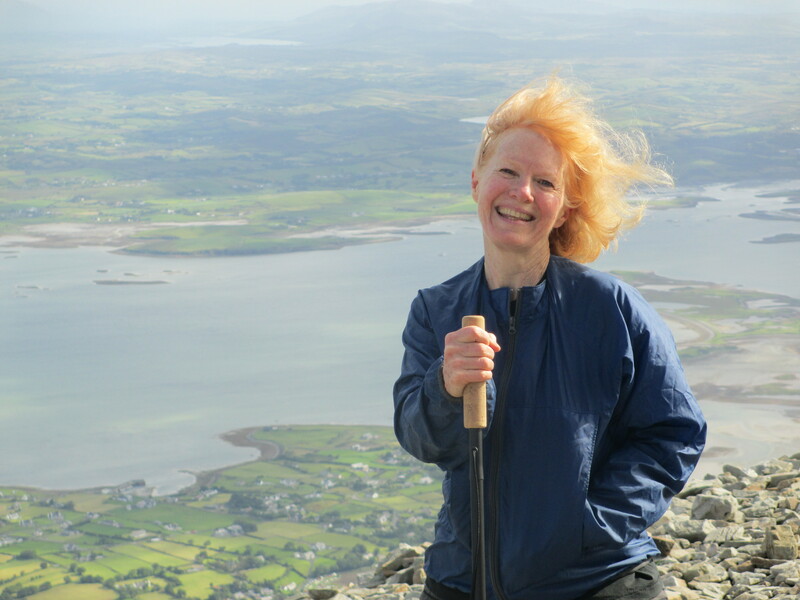 Marat Moore at the summit of Croagh Patrick mountain, Co. Mayo, Ireland. This is a revised and longer version of the inaugural lecture given by Marat Moore at the Mother Jones festival on August 1, 2012, at the Firkin Crane Center, Shandon, Cork. Go raibh maith agat. Thank you, Ger. This festival is a landmark event in the history of Mary Harris (“Mother”) Jones—the first time that her life in Ireland and her work in the United States have connected in such a powerful and public way. We owe a debt of gratitude to the organizing committee for bringing her home to Cork. As a former coal miner, I’m here to talk about how Mother Jones helped build the most powerful union in America in the early 20th century, the United Mine Workers of America (UMWA). And as a writer working on a novel about her, I will also explore Mary’s childhood in Cork, which in my view was not just the city of her physical birth, but the birthplace of all she came to be. The other story I will share concerns her living legacy and the birth of the Daughters of Mother Jones in the historic Pittston coal strike in the Appalachian coalfields. For Mother Jones, coal miners were her “boys” and the United Mine Workers union was her home in the family of labor—the family she regained years after the tragic loss of her own family from yellow fever in Memphis, Tennessee. Let’s look at one moment when she was fighting for coal miners—exactly one hundred years ago today, on August 1, 1912. She had just turned 75—although she told everyone she was in her 80s—and near the peak of her fame. On that day, she lifted her black skirts and climbed in her work boots on the back of a dray wagon beside the Kanawha River near Charleston. She spoke to a crowd of striking miners who doubted they could win against coal operators and the politicians they controlled, and companies’ hired gun thugs. The location was just outside the strike zone, was one of the few places the strikers could safely gather. In the next few months, she faced down machine guns, was arrested and court-martialed under military law on a trumped-up murder charge, and imprisoned. But she managed to smuggle out a telegram to a U.S. senate committee that turned the tide of the strike, and helped to win it. “I am being held a prisoner incommunicado in a damp, underground cell in the basement of a military bullpen at Walsenburg, Colorado … I want to say to the public that I am an American citizen, and I claim the right of an American citizen to go where I please so long as I do not violate the law. To be in prison is no disgrace. In all my strike experiences I have seen no horrors equal to those perpetrated by General Chase and his corps of Baldwin-Felts detectives that are now enlisted in the militia. My God, when is it to stop? I have only to close my eyes to see the hot tears of the orphans and widows of working men, and hear the mourning of the broken hearts and wailing of the funeral dirge, while the cringing politicians whose sworn duty it is to protect the lives and liberty of the people crawl subserviently before the national burglars of Wall Street who are today plundering and devastating the state of Colorado economically, financially, politically and morally. How did Mary Harris, the newborn baptized at the North Cathedral 175 years ago today, become “The Miner’s Angel” and “Labor’s Joan of Arc” in America? How did she find the strength and the courage to become Mother Jones after suffering so much tragedy in her personal life? We don’t know—in part because she didn’t tell the truth about her past. She must have had her reasons. As a result, we know much more about what she became as Mother Jones than how she got there. Her story began on these crooked streets of Shandon on the northside of Cork, somewhere near where we gather today. The poet William Blake said the crooked paths are the paths of genius, and that was surely true of Mary Harris Jones. I believe that Mary got a very strong start in Cork. In fact, her first 10 years here before her father and brother emigrated in 1847, were the most stable decade of her long life. We don’t know the circumstances of the Harris family, and assume it was difficult, but she had the support of an intact family, a home, a parish and a tightly knit community. As a child it is likely she was deeply grounded in the Catholic faith. Never again in her 93 years did she have that solid base of home, family, community and faith for that long a period. She needed that base. Before she was 35, she endured three personal and social traumas—famine, fever and fire. The famine here in Cork, the yellow fever that killed her family in Tennessee, and the Great Fire of Chicago. And not even making the top three are having babies throughout the Civil War, the race riot in Memphis in 1866. Research in early childhood development gives a hint about why Mary may have been resilient in later life. Children who are given loving care in their early years—and then endure an adversity that they survive with help and support—are best able to deal with trauma in adulthood. And the largely female Harris family left in Cork through the famine did survive. Mary, growing into her teens, must have played a major role in caring for the family. In these streets she also witnessed, for the first time, the ravages of economic injustice and heard the grating of the death carts. Living in the highly politicized world of Cork City, she likely understood, even at her young age, the roots of the starvation as she watched butter and meat transported to the docks on the Lee and exported to people who already had enough to eat. There are some tantalizing hints about what she may have learned during her most impressionable years. When Mary was 6 years old, for example, in 1843, Daniel O’Connell staged one of his monster rallies here. Did she attend the rally with her parents? O’Connell drew hundreds of thousands; everyone went to his rallies. I imagine her at that rally, hoisted on her father’s shoulders, thrilling to the roar of the crowd and O’Connell’s powerful voice and message about Catholic Emancipation. Years later, Mary would hold her own monster rallies, and it was her voice and her message on emancipation of workers that could move coal miners to tears. Two years later, in 1845, when she was 8, the famous abolitionist and former slave Frederick Douglass gave four stirring speeches in Cork. Did she hear Douglass speak? Or perhaps hear about Douglass from her parents and neighbors? If she did absorb some of this abolitionist sentiment, it alters the way we see her decision to move to Memphis, Tennessee, on the cusp of the Civil War. She likely was not naïve about the choice of that southern city where she would see American slavery close at hand. In the mines, you watch out for each other. I remember one day when a buddy and I worked on the coal face when a machine lost its brakes and came barreling down the incline at us with no lights. We couldn’t see it and couldn’t hear it because of the noise at the coal face. A union brother nicknamed Bullhead threw us into the tunnel wall and saved our lives. Women were first hired as coal miners in the mid-1970s, and by 1979 there were about 5,000 of us nationwide. Women miners were among the union’s most activist members, and we formed a national network that lasted 20 years and built solidarity with workers internationally. Mother Jones inspired us–we held a conference in southern Illinois just so we could make a pilgrimage to her grave. But women coal miners did much more—they confronted the union on issues of family leave, acid rain pollution caused by coal mining, and sexual harassment in the mines. They become such a force that at our annual conferences, the union president and his staff felt obligated to attend, maybe just to keep an eye on them. It was the network of women coal miners—known as the Coal Employment Project—that gave birth to the Daughters of Mother Jones in the historic Pittston coal strike in the late 1980s. By that time I was working for the United Mine Workers of America in Washington, DC, but remained active in the women miners’ movement. My job involved photographing underground in many mines and writing about mine safety, but on the side I organized miners’ wives and children. In 1988 the Pittston coal company canceled health benefits for pensioners and widows to provoke a strike. Instead the United Mine Workers of America decided to prepare for a strike by building public support and keeping the miners on the job. Public support meant family support. I proposed organizing a network of family support in southwest Virginia through the Pittston local unions, and union approved the plan and allowed me to hire two laid-off women miners to help. The three of us were the core committee. We hit the ground running and had about a dozen groups formed and they held rallies in their communities and set up a year-long informational picket line at the company headquarters. The union launched the strike against Pittston in early 1989 and decided that the women should stage a nonviolent occupation as the strike’s first act of civil disobedience. Our committee met secretly with 40 women and they wanted a name. Mother Jones came up immediately, and then someone called out, “We’re the Daughters of Mother Jones.” The name itself gave us courage. We laughed and shared her history—about earlier strikes when miners’ wives had been jailed with their babies and Mother Jones suggested they sing all night! Finally the jailer freed them because he couldn’t stand the noise! The women of the Pittston strike were worried about giving their names to media in case the company targeted their husbands for retaliation. So we numbered off: Daughter of Mother Jones #1, Daughter #2, through #40. When CNN brought its cameras into the building for interviews and would ask a woman her name, she’d say, “I’m the Daughter of Mother Jones #14.” CNN had to shut off its cameras and ask, “Who is Mother Jones?” So we had labor history sound bites on Mother Jones in print, and on radio and TV. Mother Jones said, “An army of mining women makes a spectacular picture.” In the end about 1,000 women and children were actively involved in the Pittston strike. The Daughters engaged in mass arrests and jail vigils and helped run Camp Solidarity, a makeshift camp with bunk beds that drew thousands of supporters from around the country and the world, including a group of Siberian miners. Then the students walked out of several high schools and marched to the jails where their parents were detained. And the women had their Mother Jones fun. They turned around road signs with route numbers pointing in the wrong direction to confuse the state police and armed guards. Coal operators consider wives no threat and ignore them, a fact that can be used to great advantage. Now a new chapter of Mother Jones history is being written—here, where it all began, in Cork. This is part of a second flowering of interest in her that I have seen. The first was in the 1970s and spawned books, plays, reenactors and Mother Jones magazine. This Mother Jones Rising has also triggered much creative work and her legacy has been linked to the Occupy movement and current economic and union struggles. What is her message to us today? To organize to confront the current economic and political upheaval, and work for justice. To free ourselves of prejudice and give up our petty differences. She inspired more than half a million coal miners, mostly immigrants, and with thousands of other workers in the United States. She stayed the course. What inspires me most about Mary Harris Jones is the courage of her soul—which not only predates Mother Jones, but made her possible. We live in a time as turbulent as hers. Can we carry on her legacy of resistance to powerful corporations who rob the poor and destroy our earth? Are we up for it? Let us take her brave spirit into our hearts as the sons and daughters of Mother Jones, and fight like hell for the living.